Put an end to worries about power outages with a backup generator installation from Pipe Works Services, Inc.
Storm ready. A permanent home generator is located outdoors, protected by a steel case. It’s designed to turn on automatically if utility-supplied power is interrupted. Photo courtesy of Kohler Generators. Extreme weather used to be rare. Today it’s the new normal. That’s why many homeowners are protecting themselves from power outages with standby generator installation. When severe storms take down the power lines, a whole-house generator can provide backup electrical power to keep key home systems operational. With a properly sized home generator, you won’t need to empty your refrigerator or move into a hotel. There will be no need to prevail upon friends if you need to take showers, wash clothes or enjoy the comfort of heated or air conditioned living space. When the grid goes down, a home generator comes to the rescue with backup electrical power. If you're interested in any of our services, call or contact us today to get a no-cost, no-obligation an estimate. Home generator services from Pipe Works Services, Inc. Pipe Works Services, Inc. recommends that homeowners opt for a permanent standby generator rather than a portable model. Portable generators can pose safety hazards if they’re not set up or operated correctly. In contrast, a permanent standby generator is installed in a safe location, and has built-in controls to ensure safe operation under all conditions. Natural gas and propane are the preferred fuels for permanent home generators. Pipe Works Services, Inc. installs Kohler brand home generators that are designed to come on automatically when utility-supplied electricity is interrupted. Special circuitry installed between the generator and your main electrical service panel can allocate standby electrical power to different circuits. This control circuitry ensures that key home systems (water heaters, HVAC system, refrigerator, etc.) can keep operating. Don’t wait for the next power outage! Severe weather is a sure thing today. Instead of suffering through the next power outage, why not make your home storm ready with a new generator. 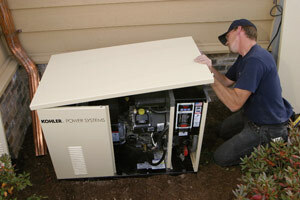 Call or email Pipe Works Services, Inc. for a generator inspection and estimate. We offer our generator services in Livingston, Parsippany, Summit, Short Hills, Basking Ridge, Florham Park, Berkeley Heights, Millburn, New Providence, Millington, and the neighboring areas in Northern NJ.